Want to spruce up your plastic patio chairs or those plain flower pots? Maybe your kids have outgrown some of their plastic play animals and you’d like to repurpose them. Whatever the case, just because it’s plastic does not mean it’s a lost cause. 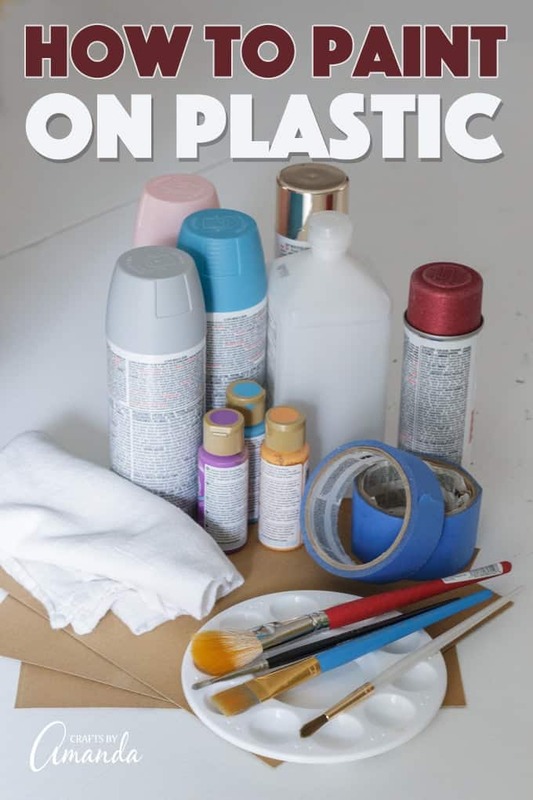 Here are the basics of painting on plastic. Tip: Check your storage shed for those outdoor items you no longer use. Visit a local thrift store for outdated plastic items such as wall hanging, frames, and figurines. Turn that trash into treasure with a fresh coat of paint. Clean your item thoroughly with warm water and mild dish soap. Be sure to remove any grime or greasy residue. Rinse with clean water and dry with a soft cloth or towel. Wipe down the entire surface with rubbing alcohol and allow to dry. Spread out a drop cloth or old sheet in a well-ventilated area, and set your item in the center. Use a fine grit sandpaper to remove any and all shiny surfaces from your item. Be careful not to press too hard so as not to scratch the surface. Plastic is nonporous and removing its shiny surface will help your paint to adhere. Use a soft, clean brush or cloth to remove all dust from the sanding process. Once your object’s surface is completely clean and dry, block off areas you don’t want painted with painter’s tape. Before painting, read the directions on your can of spray paint. Generally, you’ll need to thoroughly shake the can before starting, and in-between applications. 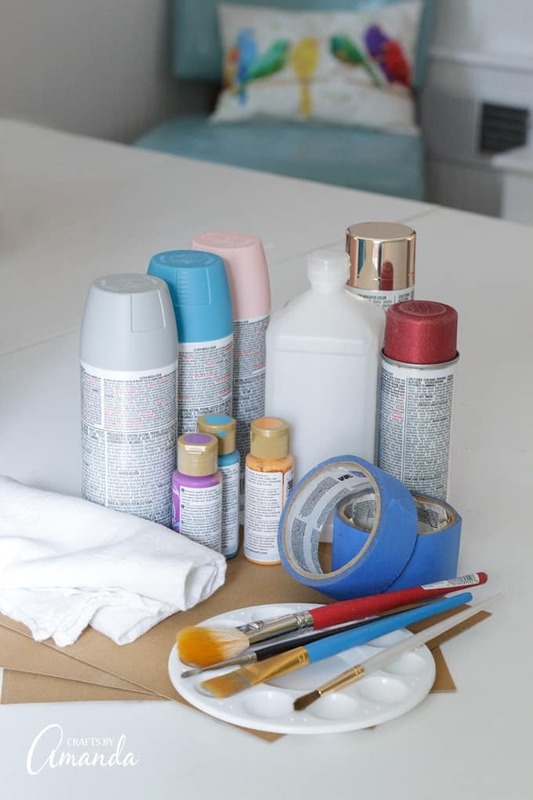 To ensure you have a good can of paint, or even that it’s the right color, do a test spray on a piece of cardboard, newspaper or your drop cloth. To apply, position the nozzle toward your object, and spray a light, thin layer of paint. With this first layer, your object should not be fully covered. Give each layer a few minutes to dry before adding the next one. It should take multiple thin, even layers to refresh your item’s color without over-painting. Allow your item to dry completely before displaying or using. Use paints that are specifically formulated to adhere to plastics. There are several available on the market such as Krylon Fusion for Plastic® , Valspar® Plastic Spray Paint , and Rust-Oleum Specialty Paint For Plastic Spray . If using regular spray paint then your item will need to be primed. Use a specially formulated primer such as Rust-Oleum Specialty Plastic Primer Spray , Krylon CoverMaxx Primer , or XIM Plastic Bonding Primer. If you are painting smaller objects or need to add small details, you may find it easier to brush on your paint. Folk Art Multi Surface Acrylic Paint and Americana Multi Surface Acrylic Paint can be used on plastic making them ideal for recycled plastic bottles, clear cake stands and other small plastic items. Keep in mind that any tableware that you paint should not come in contact with a person’s lips. So if you are going to paint a plastic cup, keep paint 1-inch from the rim. Here are some awesome tips for using glass paint and how to choose which one you need. i have ten tupperware clear storage containers from 1990. They have a yellow tint to them that looks awful. Is there a paint i can use to spruce them up? or any ideas as what i can do with them to get rid of that yellowish stain? Unfortunately because they 1) will be washed often, and 2) will be used with food, I can’t recommend painting them. After searching, I found a thread on a message board where people were talking about possible solutions for cleaning them. Here it is http://www.vendio.com/mesg/read.html?num=2&thread=407465 Good luck! I purchased plastic lemons but they are too bright yellow. How can I make them less vivid yellow? Are you looking to just paint them a different color or dull the existing color? I’m wanting to do some organizing and am on a limited budget. I’ve picked up some storage containers for both foods (like Tupperware type items) as well as their $1 storage bins to hold snacks and other items. We don’t have a pantry in our small kitchen, so my husband has made a pantry-like sliding door furniture piece that works great! While the bins will mostly be covered by the wooden sliding doors, I’d like for them to look nice and match the colors of our kitchen, instead of the bright blue, green, and pink! I don’t think paint is the solution in this case. I’m not positive what type of storage containers you’re talking about, can you find a link to them and leave it here in the comments so I can have a look? I would either find colors that match or if its open containers make a fabric liner so the items inside don’t touch the plastic surface. I tried painting a Step 2 car as a super Mario Kart for my son’s Halloween costume its 3 colors. I sanded, primered painted one color let dry a day and mask off do the next color dry same thing do the last color let dry and why I come to take off the tape it completely go ruined! Chunks peeled off. I thought i did everything correctly but my Paint was the Rustolium Enamel and I even have a clear coat as well some peeled if clear was applied. Need help please! My paint won’t stick how many days do I need to let each color dry? What was the temperature like outside where you were painting? If it was humid at all or if the temps were too cold the paint won’t cure properly. For painting the underside of the seat and the back of a transparent plastic chair so that the painting can be seen from above the chair, is there a primer and a sealer that I can use that will not obscure the painting? Has anyone ever painted a Step 2 Push Car? I’m wondering if I need to sand it down first or use one of these: Klean-Strip/Krud Kutter Prepaint Cleaner before painted with one of the recommended spray paints above. Hi Kattie :) You can use any multi-surface acrylic paint. Just be sure the surface is clean and dry before you begin. Allow the design to dry and cure for at least 2 hours, then spray with a clear sealer (any one of these will do the job http://amzn.to/2HKTyqN). Have a look above at the PRODUCT TIPS section and check out #4 for product suggestions for creating your design. I need to paint on clear plastic jars and plastic terra cotta like containers. What paint do you recommend for full coverage on the these especially not to be able see through the clear jars. A multi-surface paint is your best bet, use multiple thin coats. You can find it at crafts stores, Martha Stewart, Plaid and DecoArt all carry a line. I want to paint some plastic bottles and use them a Mother’s Day presents for my kindergarten class. What type of paint should I use? Will painted plastic withstand the motion of feet from someone sitting in a computer chair with a painted plastic base? I am not sure if it would. It may for a while with a few coats of sealer, but it may need to be touched up over time. What kind of sealer would you recommend? In my case, for a vintage plastic toy that was my sister’s that I am refurbishing for a baby shower gift for her to give to her daughter. I would be brushing the paint on. But I was thinking a spray for the sealer. So, Gay I was thinking about your dilemma – are you wanting to paint one of those ugly plastic carpet protectors that the desk chairs roll on? If so what about contact paper and then perhaps a coat of sealer or the clear contact paper for windows on top to protect the contact paper…that way you could paint and then cover – either/or ?Hope this helps! The plastic chair mat will flex and have too much pressure on the surface to use contact paper or paint, even with sealer, especially if it is on carpet. If the mat is clear, you could use spray paint for plastic on the underside, and if it’s the kind for flat floors, not carpet, it may eventually rub off, but should last quite a bit longer than painting it on top. Be sure to clean well and dry before painting. You won’t be able to use primer if you want to see the color underneath. I’d probably let it cure as long as a month before putting it down. The most curing will happen soon, but paint can become harder and tougher over time. A well-respected newsletter about children suggests that 2-4 month old infants can get a head start developing hand-eye coordination if this is done: “Paint some bright red polka dots on the white shield of a pacifier,” then mount the painted pacifier in the center of an 8″ diameter circle of white cardboard. The whole thing is tied to an upright crib rail about 8″ above the baby’s shoulder. The idea is that the baby likes the look of this set-up (you can see why!) and swipes at it first with his fist, then with his open hand. The idea is NOT that the baby ever gets hold of it — you remove it before that happens. Also, you only have this available to the baby if an adult is nearby. Any tips for painting on this kind of plastic (pacifiers)? Sandpaper versus liquid sander, spray paint versus brush, brush type, sealant? Personally I wouldn’t recommend this because there’s always a chance the pacifier could end up in baby’s hands. Most commercial acrylic craft paints are non-toxic, but they aren’t approved by the FDA because the process for approval is so costly. Therefore manufacturers simply don’t do it. In this particular situation the paint does not need to last for a truly long time. So just use the handle end of a paint brush, dip it in the paint and add polka dots to the plastic. Use a couple coats of sealer over it. This pacifier would never be used for any other purpose other than this so there’s no need to worry about the paint wearing off or not lasting over time.